Happy Easter Monday! I hope that you enjoyed/are enjoying a fantastic holiday weekend with your family. I am just popping in today to talk some more about Close Reading in French. You may remember that I posted about it a few years ago - HERE and HERE. I have had soo many requests over the past year or two to create more resources for French Close Reading, but I've had such a hard time finding both enough time and the perfect books! 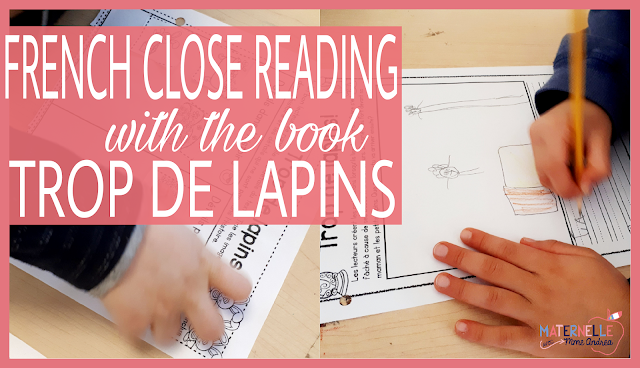 But, I am really excited to be here today to talk about some close reading activities that we did with one of my new favourite books - Trop de lapins (affiliate link) by Trace Moroney. First of all, in case you missed it before, what is close reading? Close reading is what you are doing when you read a text or a book thoughtfully and critically. You focus on important details and patterns within the book, and develop a deep understanding of the book (what happened, how/why the book was crafted, the meaning of the book or certain passages, etc.). It is reading to analyze and reading to understand! This can be tough in a second language. But, it is possible! It's a lot! Especially for my students who speak English at home. We tackle these strategies using close reading. When we close read, we study the same book for about a week. Teaching these strategies is so important. Reading is about so much more than just decoding, and sometimes we forget that. I have definitely caught myself patting myself on the back and congratulating myself for teaching students to successfully decode... all while forgetting that reading is so. much. more! Without understanding and being able to make deeper connections with what you are reading, there isn't any joy in reading. I don't know about you, but I don't want to teach my students to read just so they can "level up." We all know that life and academics are much, much easier if you are a proficient reader. I want my students to love reading! I want them to read all the time, and find joy, adventure, knowledge, and so much more from books. This can only happen if they understand and connect with what they are reading! Close reading is a great way to dive deep into some great stories and books during whole group time. I get to do the tricky decoding work, so that their brains are free to do the deep thinking work. And we all know that practice makes perfect - our students won't learn to do this efficiently on their own if we don't practice with them! 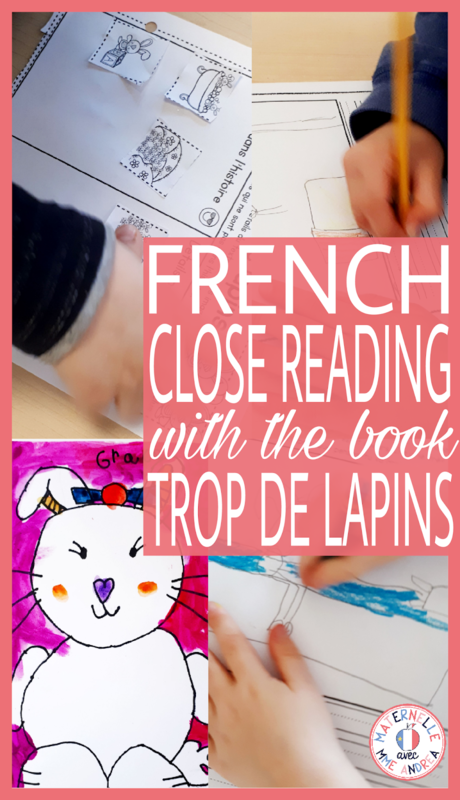 Trop de lapins by Trace Moroney is my latest favourite close reading book! Because of the bunnies, it was perfect last week, right before Easter, but it is also great any time of year. The actual theme of the book is about becoming a big brother or sister and all of the frustrations and joys that come along with it. It is a great fit for when you are teaching about families or changes within families! We started off our study of the book by doing some predictions. I usually will do either predictions or visualizing on our first day of close reading. In the story, the big brother ends up having a little temper tantrum and yelling at his mom in front of his new baby siblings. We read the story up until that point and then predicted what might happen next. 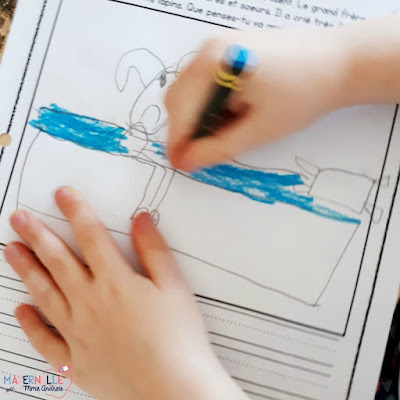 We first shared our ideas out loud, and I picked one to draw on chart paper. We decided on a sentence to write, and we wrote it together (shared writing). My students came up and wrote the sight words they knew, and helped me decode new words. Then, everyone recorded their own predictions independently. It's okay if they use the same idea as me, or if they have another idea (I did get "my" idea from another student, after all!). This student thought that the big brother would be sent to his room! On Day 2, I always like to check for understanding. Sometimes, we will put the story in order, but if there are a lot of events that aren't super sequential, we will complete a T-table of things that did/did not happen in the story. They did a great job at this! 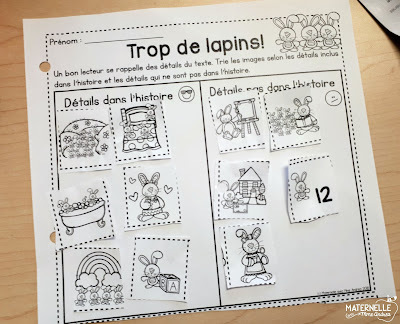 After completing it together, they went to work and completed an independent sort. 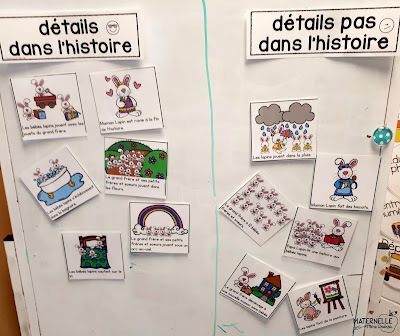 We also used this story to make connections (we shared a time when we felt frustrated and/or threw our own little tantrums), explore new vocabulary, and look for the problem and the solution in the story. 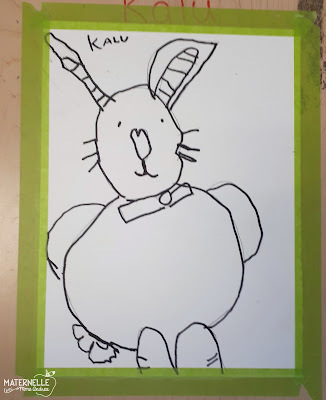 We finished off our week by doing one of my favourite directed drawing activities from Proud to be Primary. I always like to try and incorporate a little craft or art activity at the end of a week of hard work. 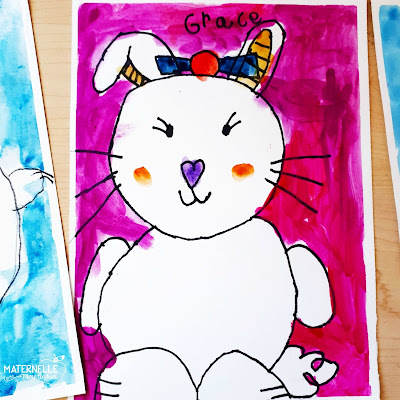 Check out our cute bunny drawings! I do have some more in the pipeline, and I am hoping it won't take me as long this time to get them out! 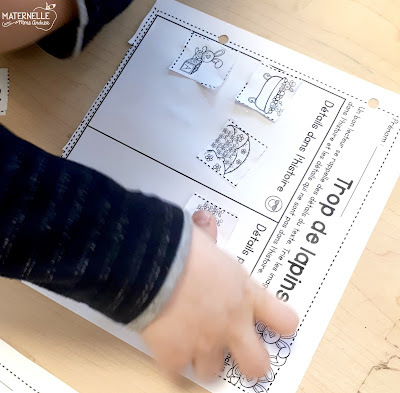 Cahier interactif en maternelle? OUI, tu peux!